While here in UK for Fairtrade Fortnight, Elias and Agnes had asked if they would be able to visit a farm. We were able to set up a visit to Ripple Farm, a small organic farm situated in the Stour Valley in Kent. The owners Martin and Sarah were kind enough give up a few hours of their Sunday afternoon to show us around and explain how everything works. It was great to see Elias and Agnes in the fields of Kent. When Kuapa Kokoo farmers visit, they generally get to visit all kinds of amazing places – from company offices, to town halls, to schools, to national civic buildings – but they rarely ever get into the countryside. Here they were in their element: talking to a farmer like themselves. Comparing the impact of the seasons and the weather in the UK and Ghana was a recurring topic of conversation. As we stood looking at several rows of leeks, the cocoa farmers were amazed to hear that most of them had been planted twelve months earlier. Martin from Ripple smiled ruefully as he explained that when they plant maize for corn on the cob they will harvest one round of corn each year, and only if it is warm enough. We walked though a field of brassicas, tasting leaves from various kinds of cabbage, curly kale and cavolo nero. We dug up a swede – Elias thought it was much like yam. We uncovered beetroot from under a winter bed of straw. The farmers observed that you didn’t need to keep crops warm like that in Ghana. They tried beetroot for the first time and thought it was delicious. Ripple Farm also rent a beautiful Victorian walled garden up on a hill, with a stunning circular wall around it. Here they grow salad leaves in various old greenhouses. One of the greenhouses contained a warm and humid plant raising nursery, which the cocoa farmers loved. Elias was very interested in exactly how Martin sells his vegetables. Do buyers come to the farm? Do they haggle? Martin explained that they take the vegetables to shops and farmers markets, locally and in London. He tends to set the price, and the English don’t go in for much haggling! The cocoa farmers enjoyed climbing on the big potato harvester and admired Martin’s vintage 1950s tractor. 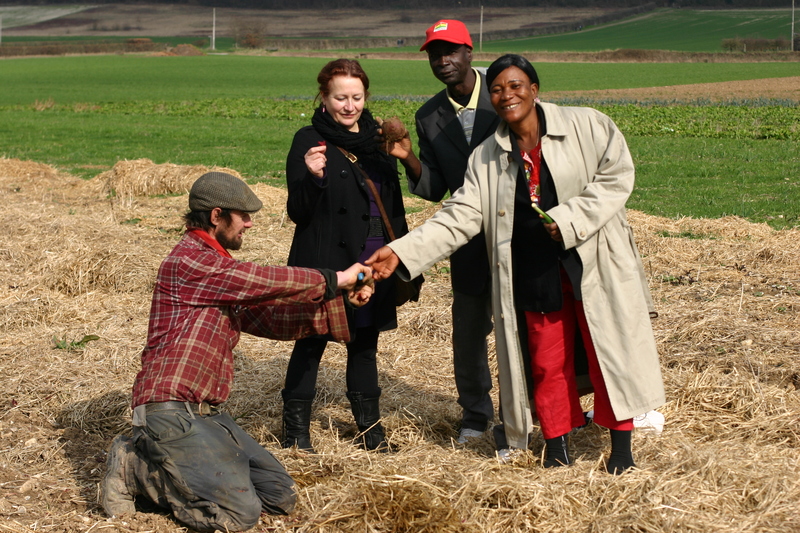 Despite the fact that Ripple Farm is actually a small, low tech, labour intensive farm by British standards, Elias and Agnes remarked on how many machines there were compared with their own farms in Ghana where the only tool is a machete and everything is done by hand. Afterwards, Martin and Sarah treated us to a delicious lunch and we took the train back to London.